Who... who drew that? That is some really ugly artwork... I mean... just... eaugh, no. He's not crazy if he's talking about the in-comic artwork, which indeed is disgraceful. The covers are amazing, though. W-WHAT?? That style looks fantastic! Something about it just looks horribly off, to me. Maybe it's the exaggerated pose the fat, chubby, overly- aggressive Megaman is striking, or maybe it's the weird proportions and the extra doodads on Breakman that's throwing me off. Iceman looks a bit off, too. You're not alone, the art style for the cover doesn't appeal to me either. It's not bad, I won't go that far, but it's not the best either. My favorite covers are the ones that Ben Bates draws. 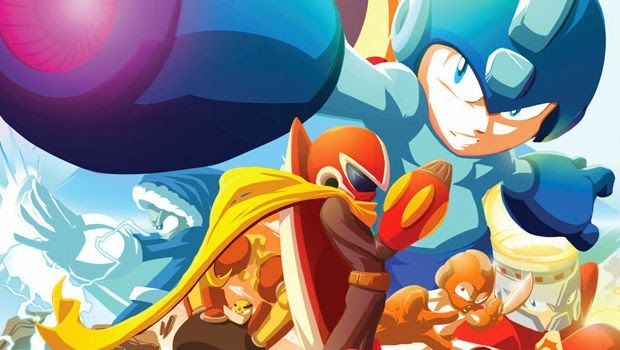 He has a real solid grasp on Mega Man (and Sonic) that I actively look forward to seeing. It has an amateurish tone to it but it's not altogether bad. The composition is really good and I like all the poses of each character. I just think the style leaves a lot to be desired.